Completed in 1894, this large French gothic building was a gift to the Town of Fairhaven by oil magnate and town benefactor Henry Huttleston Rogers in honor of his first wife, Abbie. The building features magnificent stained-glass windows and ornate woodwork, along with extraordinary terra cotta sculptures and detailing on the exterior. Author Mark Twain spoke at the 1894 dedication. Since it’s dedication the town has had a tradition of gathering for caroling on the steps of the town hall each Christmas season, then gathering inside for hot chocolate. Each year we try to go somewhere or do something special for Christmas. This year Cheryl and I took the Fast Ferry out from New Bedford for a holiday weekend on Martha's Vineyard. It was an absolutely wonderful weekend. We arrived on Saturday afternoon, with the streets and shops bustling with Edgartown's Holiday Weekend. The Edgartown town hall was decked out with wreathing, wreaths and lights. Christmas trees dotted the streets, all lit in the evening. Always a very beautiful town, Edgartown took on a special holiday glow that season. This view of the saltmarsh overlooks Narragansett Bay in Tiverton Rhode Island. The marsh is covered in ice, as is the bay beyond the stand of trees. This is an image close to a friends home, one that I had driven by for years before I decided to make an illustration of it. I'm pleased with the way the composition leads the eye from the foreground to the distant hills across the bay. There is a tranquility to this image, and it reminds me of the quite of a winter scene, the air still, the sound of the ice cracking in the cold. This pen and ink drawing was of a farm on the hillside of Mount Wachusett, in Princeton Massachusetts. My friends Lee and JoAnn were visiting me the winter I lived in Leominster, MA. We went for a drive after a heavy spring snowfall, and ended up driving along the snowcovered hills of Princeton. It was a late snowfall, one of the last of the year. We had great fun driving the back roads, and seeing such beautiful vistas. This is a late afternoon image, the shadows fall off to the left, as the sun begins its decline. What I likes most about this is it is such a pure New England image. It could be Vermont, New Hampshire, Maine or Massachusetts, but it is very New England. Finally, a pen and ink of my own, newly renovated home. After over twenty years of waiting, the home that had been my Grandmothers was renovated and expanded. This is the family room, with a bank of windows that overlook Buzzards Bay. This was also the first year of again having my Christmas Tree decorating party. This party had started back when I was in high school, with friends coming over to help me string popcorn. And so in 2002 the tradition was continued, with friends from church coming to help me string popcorn, and restart a wonderful celebration of the holiday season. This is an image of one of the mansions of New Bedford. It was built in the mid 1800's. It has an air of age about it, with the formal tree and piano. This was the first Christmas after September 11th, and everyone had a tougher holiday season this year. And so we all learned of the horrors of September 11th. It hung in the air as I visited Dublin that December. Irish firefighters collected relief money for their comerades in New York City. I fell upon an older drawing that I had never finished, and a compelling poem of loss at Christmas-time, as Longfellow learns of the death of his Son in the Civil War. 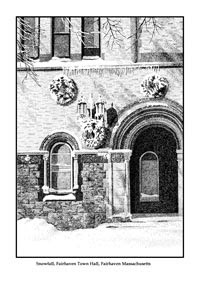 The poem Christmas Bells by Longfellow in featured inside this finished 2001 Christmas card. This Christmas card was of Mattapoisett's Shipyard Park. I caught an image of the park the day of a snowfall, with heavy laden clouds and snow. This image is as the storm begins to break, with the sky clearing. Shipyard Park was originally the location of a boat yard, where whaling ships were built. At the turn of the century a group of local citizens purchased the land and donated it to the town for the purpose of creating a park. Atop the gazebo sits a wind vane in the shape of a whale, recalling the town's seagoing heritage. It is now a location where people stroll the waterfront, watching the parade of boats in the summer. In winter it is a bit more deserted, but beautiful in its quite. Winter sticks dot the harbor, as memories of summer past. The Christmas tree is lit, and stands sentinel to the harbor. The Parish Hall of the Fairhaven Memorial Church is a magnificent building that is attached to the church. It is full of leaded glass windows, carved oak figurines, and fresco murals. This picture was created in New Hampshire, while I was still living in Keene. I am still refining the stipple style of pen and ink, using a variety of textures in the carpet and the floor. I have managed to work a few sailboats into the Christmas tree. This was quite a Christmas trip for me. I took a bus to Manhattan with a friend who had gone to school in New York City. We had a wonderful day of walking the city. We went to Katz Deli to start, and walked our way back through Little Italy and Chinatown. The day ended at Rockefeller Center. What a glorious Christmas tree it was. So brilliant with millions of white and colored lights. I had never seen such a tree. The crowds were thick, but it was a real celebration to share the atmosphere with so many. I was enchanted, and so made this my Christmas card for 1993. Great memories of a wonderful city during the holiday season. This was my third Christmas Card illustration. It was done from another Holiday House Tour, this one in Marion Massachusetts. The framing borrows heavily from the glass engraving that I was doing at the time for Pairpoint. The details include an array of toy rocking horses on the bookshelf, along with an angel tree top. Interestingly, this picture was done while I was spending a month in Venezuela, so I have memories of both the winter, and working on this in the tropical sun. Included amongst the tree decorations are a number of sailboats, along with an hour glass, teddy bears and candy canes. I wanted to make the easy chair look inviting, and worked a lot with the lighting to provide the chair with an inviting, casual appearance. This was my second Christmas Card illustration. This image was taken from a Holiday House tour on Cape Cod. This particular home was overlooking Quissett Harbor, a place that I had sailed often with friend Dave Perry. It was a classic old Cape Cod home, complete with many antiques, such as the bureau and ships model in the background. The ornaments were all imported from Germany, handmade and quite exquisite. It is an afternoon image, before the sun starts to set. There are wreaths on the windows, and presents hidden under the tree. The original drawing is now lost, and there are very few copies of this print left. was how I was able to capture this image. on the tree. There is a stillness to this first pen and ink. I work in pen and ink, and each Christmas card drawing takes months. I have been painting and taking photographs for most of my life. In that time I have worked as a commercial artist, logo designer, product photographer, portraitist, marine photographer and videographer, as well as taking specialized photos of handblown crystal. In my time I also spent four years cutting crystal for Pairpoint Crystal Company. Today I work in high tech marketing, which I really enjoy, but still keep my hand in the arts through my pen and inks and watercolors.